Sun Apr 19, 2015, 8:30pm. Boston International Film Festival. Venue: Paramount Center (559 Washington Street, Boston, MA). The film screens in Session 22, alongside the short The Road to Sainte-Mère-Église and the feature A Sort of Homecoming. [Tickets] - click on April 19 on the calendar and select "BIFF: Session 22"
Thu Apr 23, 2015, 8:10pm. Ithaca Pan Asian American Film Festival. Venue: Cinemapolis (120 E. Green Street, Ithaca, NY). The film screens alongside the short We Are All One and the feature She Lights Up Well. Admission is free. Sat Apr 25, 2015, 7:30pm. Southeast New England Film, Music & Arts Festival. Venue: Columbus Theatre (270 Broadway, Providence, RI). The film is featured in Short Film Program 4. Tickets will be sold at the door for $10 ($8 for Seniors/Students/RIFC Members), cash and credit cards accepted. Wed Jun 17, 2015, 7:30pm. NewFilmmakers New York. Venue: Anthology Film Archives (32 Second Avenue, New York, NY). 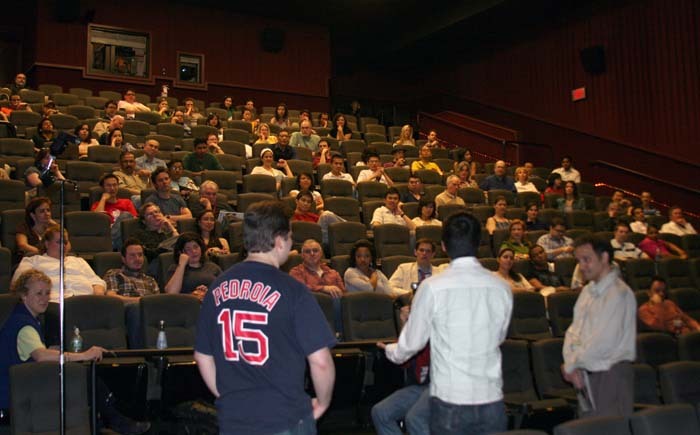 The film screens within a short film program. Admission is $6. Sun Oct 11, 2015, 2pm. Atlanta Asian Film Festival. Venue: Cisco Auditorium, Georgia Gwinnett College (1000 University Center Lane, Lawrenceville, GA).